Supercharge your supermarkets with an innovative and agile grocery POS system. Today’s perfect grocery store point of sale and retail management solution is full-featured, speedy, and reliable. Supermarkets need a POS solution that is seamless, running on grocery POS software that is fully-connected to the rest of the store. Cash registers must do more than print receipts and hold cash. The perfect POS system talks to inventory, loyalty, analytics, and accounting. Grocery stores carry tens of thousands of products: fruits and vegetables, meats, breads, and dairy. Keeping track of product volume and sales data will maximize profit and help avoid spoilage, shrink, and stock-outs. When a grocer goes with Catapult point of sale, all of this is possible. We built Catapult to streamline supermarket operations, cut costs, grow grocer’s profits, and maximize efficiency. Catapult goes beyond omni-channel and it’s more than unified commerce. It is scalable and responsive thanks to Unified Transaction Logic™. This means all critical areas of operation in a retail enterprise are all connected in real time. Your traditional checkout lanes, deli scales, self-checkout terminals, pharmacy, fuel, web orders, and even smartphone apps all work as one. It is a comprehensive solution that enables efficient HQ management for grocery retail. Whether you need a POS system for a corner market in downtown Hamilton, a specialty Italian bakery in Oakville, a dozen butcher shops in Ontario, or 100 grocery stores across Canada, Catapult can cover all of it at a lightning-fast pace. Every retail touchpoint, from eCommerce to self-checkout, should be connected to one platform. Streamlined data transfer between the point-of-sale and pharmacy system enables faster customer checkouts, simpler data/reporting management, elimination of multiple signature capture devices, and enhanced functionality. Catapult’s easy to use touch screen allows for multiple menu screens for cold and hot beverages, sandwiches, salads, pizzas, and whatever other food services you want to offer in your grocery store. Catapult can even handle remote kitchen preparation printers with modifiers so that you can get your customer’s orders right every time! Grocers must easily handle high-volume sales so checkout lanes move quickly. Loyalty programs should work smoothly to keep customers happy. Transaction data should feed continuously into the back office for real-time analytics and inventory management. With Catapult, everything clicks – instantly. Catapult features scale integration, which means that with our hardware solutions, you can fully integrate Catapult into your scanner-scales, deli, and prepared foods departments. With Catapult, your discounts, dynamic promotions, rewards programs, and other transactional processes work the same. At the front-store and online, your customer relationship management tools all work in unison. LoyaltyBot® lets retailers set up marketing campaigns that automatically provide patrons with rewards based on specific automated triggers. Best of all, it is easily customizable. Catapult has full-spectrum inventory capability to synergize supply chains. It can replace your current inventory management software and cut down on complexity. Connect your inventory controls to the rest of your supermarkets operations, seamlessly. Perpetual inventory helps to avoid stock-out scenarios and keeps fresh food orders flowing at optimal pace. The Order Assist™ module displays suggested item order quantities based on forecasted auto-replenishment calculations and can then generate a purchase order for each associated supplier. And, while you’re on the floor, you can easily print easy to read, high contrast shelf labels using a portable label printer. Now store associates can print shelf labels on-the-fly from anywhere in the store! Why are some grocery markets thriving in the face of change while others are facing uncertain futures? A major component is being able to make critical decisions based on real, actionable data. 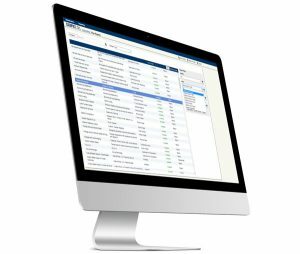 With over 300 pre-built reports established from best practices and retailer insight, you will have the data you need to better run your business. Each report can be filtered by endless data dimensions. Our grocery POS software can run reports by product and department so you know what brands and what items are driving your sales – scalable from a one location to hundreds. Have you stocked enough avocados in your produce department? Is one soft drink brand outselling another? Which brands are driving sales and profitability? How much of your fresh foods and perishables are spoiling/expiring? Who are your top 100 shoppers? Where is inventory shrink occuring? How can you optimize deployment of store associates? Catapult eliminates the need for unnecessary third-party middleware or gateways to process electronic payments. Instead, you get a direct, ultra-fast connection with the best and largest processors. You can grow your customer base by taking a wide variety of payment methods. High-touch service is of critical importance in retail, especially in supermarkets where patrons often need guidance to navigate their journey. Monitor performance to hold associates accountable and guard your bottom line. 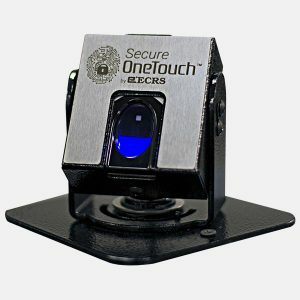 What features should I be looking for in a grocery store POS system? A truly seamless and scalable grocery POS needs to be running in real time across the enterprise. It should do more than simply ring up transactions, it should tie together the majority of store systems and services to reduce friction. The ideal grocery system should be using the information gathered at the POS to generate reports, monitor inventory, and offer insight to enterprise executives. For more detailed insight into what features you should be looking for in your next POS system, check out our comprehensive guide. What kind of grocery stores can Armagh service? Catapult is versatile. 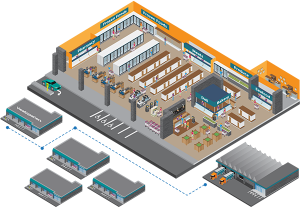 Whether you run a 100-store supermarket, a speciality foods store, a regional organic market, a butcher shop, or a convenience store, our system and hardware solutions can cater to your needs.